A flyer has been circulated to announce the details of three workshops that will be held in February 2017. A final workshop will be held in March to gather and collate all views to feed into the review process. 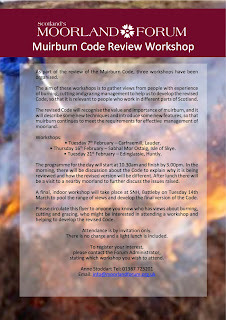 The flyer can be downloaded from the Muirburn Code webpage. A final draft of a revised Code will be produced at the end of March, and this will incorporate the feedback from the workshops. The aim of these workshops is to encourage those with experience of burning, cutting and grazing on moorland to provide their views to help with the review process, and we are keen to hear from as many people as possible. The Muirburn Code Review Steering Group met on 14 December. A further draft of the Code was reviewed and we agreed good progress is being made. There is plenty still to do and a further draft of the Code will be prepared and circulated to all those attending the workshops. The intention is to present this further draft on a dedicated Muirburn Code website, as this will allow the essential information to be presented clearly, but there will be links to additional, more detailed information, if this is required.